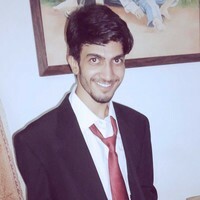 Before going to understand the process how to send the push notifications. We would like to tell you about the types of the push notifications. And how it will beneficial to the admin. There are four types of push notifications that admin can send to the mobile application users. 1) Category Type:- You can send the push notifications according to the offer on a category. For example: Suppose you want to give an offer on clothing category. Then you can send category push notification to your mobile application users. Your customers will receive a push notification and whenever they will click on it. Then they will be redirected to the clothing category page. 2) Product Type:- You can also send the push notification for any particular product. For example: Suppose you want to give an offer on a camera. Then you can send product push notification to your mobile application users. Your mobile application users will receive a push notification and whenever they will click on the notification. Then they will be redirected to the product page of the camera. 3) Other Type:- In this type of notification, you can send the notification to your mobile application users as a text or an article. For example: Suppose you want to give an offer on New Year to your mobile application users through a coupon code. Then you can send a text or an article notification with the coupon code in it so that your customers can visit the notification page and can use this coupon code for the discount. 4) Custom Collection Type:- You can send push notifications according to the specific products collection. For example: Suppose you want to give an offer according to the product attributes like gender, product type, price, special price, category, name, SKU etc. 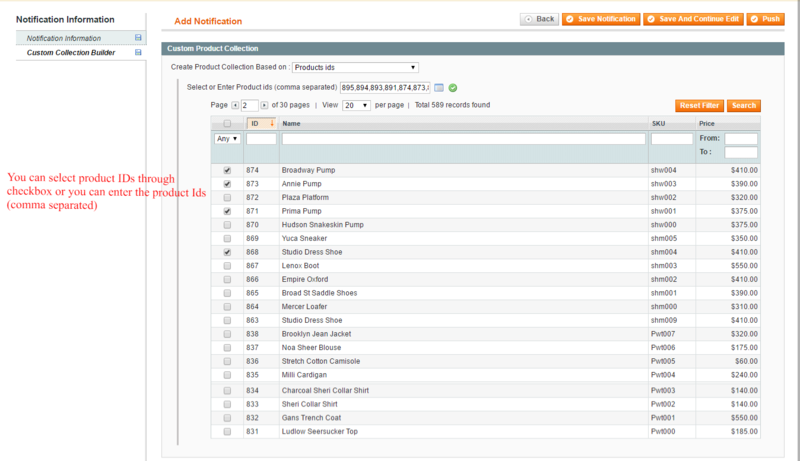 You can select the multiple product attribute options while creating the custom notification. Then you can send the custom collection push notification to your mobile application users. Your mobile application users will receive a push notification and whenever they will click on the notification. Then they will be redirected to the custom collection page. In the admin panel, under Mobikul, select Add/Manage Notification. Then you will be redirected to Notification Manager page. The Notification Manager page contains the information of existing notifications. As per the below image, you can see a list of existing push notifications. You can select and send the existing push notifications. Also, you can edit or delete or change the status the existing push notifications. When you will click on Add Notification button then you will be redirected to the add notification page. Here, you can add new push notification which you can send to your mobile application users. As per the below image, you can see the required field for creating a push notification. i) In the Notification Title, enter the notification title according to your store language. ii) In the Notification Content field, type the content that will be visible on the notification. iii) In Notification Type, select the notification type by using the drop down button. 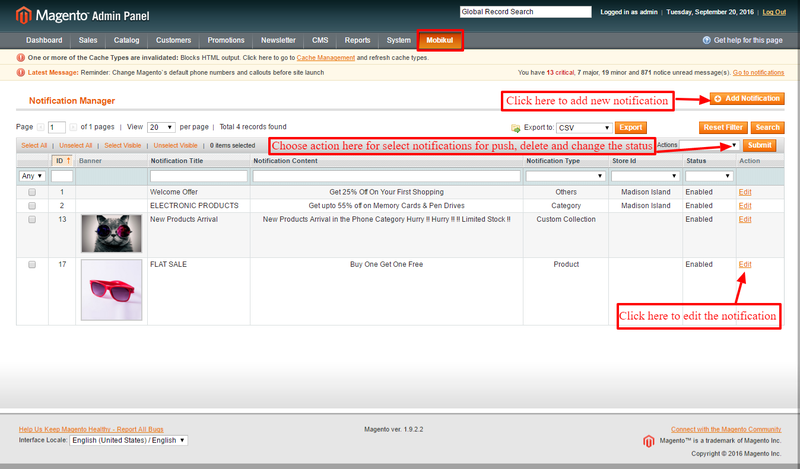 v) In the Product/Category ID, select the ID according to the notification types. vii) In Notification Status, select the status either Enabled or Disabled. Admin can send the push notification or admin can only save the notification for future purpose. 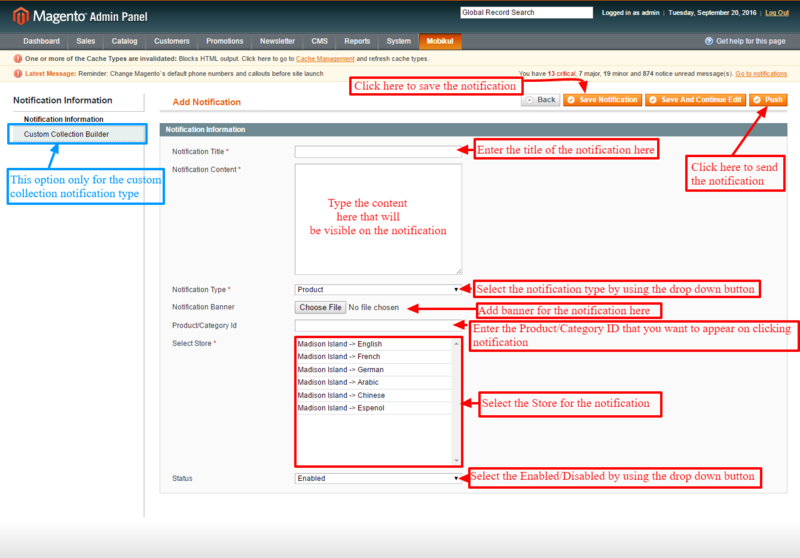 If you choose custom collection notification type while creating push notification then you will need to create the custom product collection through custom collection builder. When you will click on custom collection builder then you will be redirected to the custom product collection page that you can see as per the below image. a. Product Attribute Assigned: In this option, you can add multiple filter attributes to product collection like product type, gender type, name, price, category etc. You can see as per the below image. b. Product IDs: In this option, you can create a product collection based on different Product IDs. You can choose multiple product IDs in the single collection. As you can see as per the below image. c. New Added Product with count: In this option, you can create a product collection based on your newly added products.Here you need to enter the newly added products count which you want to appear in the product collection. You can see as per the below image. What will happen if a customer missed a push notification ? – Customers can see all the received notifications in the notification tab. How are the push notifications beneficial for the admin ? – Push notifications increase the customers’ engagement over the mobile application store. It helps in increasing the sale. It has a huge role in increasing the revenue. There are some other benefits of the push notifications that you can see by clicking here. If you haven’t built the mobile application for your Magento Store or Magento Marketplace, then what are you waiting for ? for your Magento Marketplace Store – Mobikul Marketplace.